after you have completed two of our gardening courses. The focus of The Gardening Consultants Council is to help its members become accomplished horticulturists. The Council generally meets four times a year with programs and field trips with the goal of increasing the knowledge of, and stimulating interest in horticulture and keeping members informed of advanced gardening techniques. For information on current Gardening School Courses, click here. The Council offers a variety of memberships. Provisional Members are those having successfully completed two or more NGC Gardening Courses. They may remain a Provisional member for not more than five years before qualifying as an active member. Provisional members are not eligible to vote or hold office, but may serve on committees. Active Members are those who have successfully completed all four of the NGC Gardening Courses and therefore, hold a certificate as a Gardening Consultant. Active and provisional membership in the Gardening Council is limited to members of The Federated Garden Clubs and to affiliated professionals requesting membership. Affiliated members should meet the requirements for provisional status of the Council and intend to finish all four Gardening Study School courses. Associate Members are those persons who wish to participate in Gardening Consultant activities, who have or have not taken Gardening Consultant courses, but who have professional or educational qualifications of equal merit. Associate members may not vote or hold office. The Katherine Patrick Gardening School Fund was established in 2018 with a generous donation from Jaclynn Patrick Lee in memory of her mother. Katherine was Chair of the Gardening Consultants Council and the Gardening School. Katherine’s love for the Gardening School and its dedication to providing the foundation courses in horticulture, makes this the perfect tribute. Funds are held in a restricted account of the Gardening Consultants Council, and the Council shall determine the use of the funds. A primary use will be to support the Gardening School by offering two “Gardening School Tuition Awards” each year. To donate to the KP Gardening School Fund, click here. The Gardening Consultants Council also judges gardens throughout the state to determine the winner of the FGCCT LOVE-LY GARDEN Award. This Award is presented to a gardener who has shown a love of gardening in creating and maintaining her or his garden. Anyone, including a non-garden club member, may nominate the garden of a member who has created and maintained a garden, with that gardener’s permission. A member is welcome to nominate her or his own garden. 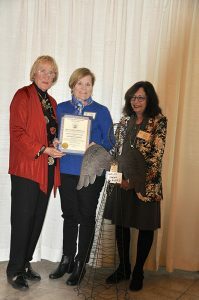 At the 2018 Awards Meeting, Joanne McKendric presented the Penny Jarvis Love-ly Garden Award to Beverly B. Smith, a member of the Riverside Garden Club. The application deadline is June 15th each year. Gardens will be judged during the summer. For more details and an application, click here.